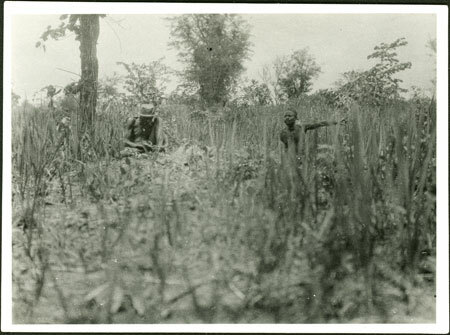 An operator of the poison oracle (benge) seated to the left (identified as Windis or Zori). The oracle questioner is identified as Bawili son of Bagbe, who is seated nearby to the right, gesticulating in his address to the oracle. Poison oracle consultations take place away from habitation, often at the edge of cultivations, so as to ensure secrecy and to avoid pollution and witchcraft. Notes on print/mount - "Windis & Bawili"
Morton, Chris. "Consulting the Zande benge oracle" Southern Sudan Project (in development). 03 Jan. 2006. Pitt Rivers Museum. <http://southernsudan.prm.ox.ac.uk/details/1998.341.341.2/>.